Today’s electronics are more sensitive to moisture contamination even with little or no pressure differential present. Consequently, seal requirements that were satisfied with environmental seats now must use a true hermetic seal despite design limitations and higher cost. The old method used to pass electrical signals through a bulkhead without leaking was to attach the wire to a glass or ceramic sealed pin. Pave Technology Co®., Dayton, Ohio, has developed sealing technology which employs transfer molded epoxy to provide the seal. The epoxy sealing approach offers a new design option that does not require attaching wires to sealed pins. the missile from shallow water submergence. The seal weight is only 2 g.
Allowing the wire or cable to pass through uninterrupted while maintaining complete seal integrity means simpler design approaches, easier and lower installation costs, and higher electrical reliability because the wire remains continuous through the bulkhead with no solder terminations. The wire or cable is permanently sealed in place in the epoxy with the cable pull-test spec typically exceeding the tensile strength of most wires, and is virtually vibration-proof. Electrical hermetic connectors based on a two-part mineral filled epoxy sealing technology have been around for nearly a decade. However, sealing to various metal housings with different coefficients of expansion over a temperature range of -100 to +200° C proved to be difficult. Once a successful bonding process was determined, a process was developed to seal insulated cable, solid copper or stainless steel pins. This prevented leakage through the stranded conductor and any shielding. Unlike glass or ceramic processes using high-temperature fusing techniques, the epoxy seal is a lower temperature process that does not affect low-temperature insulation. The cable conductor (stranded or solid) is “blocked” along with any shielding and insulation with the epoxy seal. The original cable electrical characteristics remain virtually unaffected. This can be critical for proper impedance control of coaxial cables, temperature reading accuracy of thermocouple wire and fiber optic cables since the conductor remains continuous. Only in high-frequency applications does impedance control break down with the epoxy seal due to dielectric constant differences between cable insulations and epoxy. Hermetic seal performance for vacuum or pressure applications is defined by a leak rate specification. Using any of the various test methods on an epoxy seal will show virtually no detectable leak. The most widely accepted leak test is a helium test with a calibrated leak rate. Most commercial grade glass or ceramic seals have leak rates of less than 1 x 10 -5 SCC/S at one atmosphere differential. Epoxy seals have leak rates typically between 10 -7 and 10 -10 SCC/S. Epoxy seals allow the use of a higher number of electrical conductors using round or flat cable. As good as hermetic epoxy seals can be, there are limits. Effective temperature use is limited to – 200 to + 200° C. Epoxy seals are not suitable for certain chemical solvents such as ketones and strong oxidizing acids. Even with the epoxy seal’s low outgassing properties, there will be some outgassing in ultra-high vacuums (10 -9 torror higher). Unique designs are possible using epoxy’s modifiability. 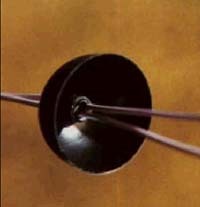 Figure 1 shows an egg-shaped, thin-wall pass-through used to seal a missile nozzle from shallow water submergence. The design also has to seal for a vacuum. High density of electrical conductors is an advantage of epoxy seals, using round or flat cable. Figure 2 shows a combination of PTFE insulated wire and a custom designed and fabricated polyimide flex circuit used in medical centrifuges. Another example of high density uses as many as 400, #28 PTFE insulated wires sealed in a 3.75 cm diameter for high-speed computers. Specially designed flex circuits with densities as high as 40 conductors per centimeter can also be offered in hermetic seals. Printed circuit boards also lend themselves to hermetic epoxy sealing technology through bulkheads. Finally, epoxy seal technology offers relatively low-cost custom tooling and set-up compared to glass or ceramic seals.